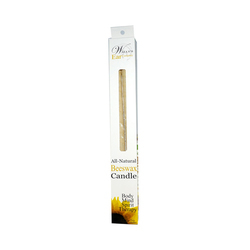 Relax, unwind and enjoy the calming effects of a WallyÍs Natural Ear Candle. Ear Candles are a wonderful holistic relaxation device that is used to melt away stress and daily frustrations. As the candle burns warm air and rhythmic sounds moves down the candle creating a tranquil experience.